Mia recently had her birthday celebration at school! 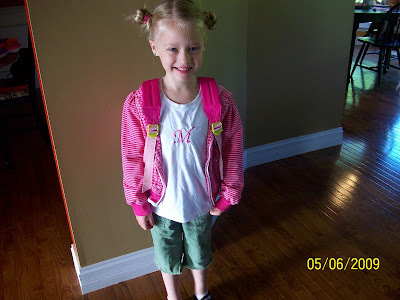 Since her birthday is in July we got to pick a day that she could celebrate at school with her friends. 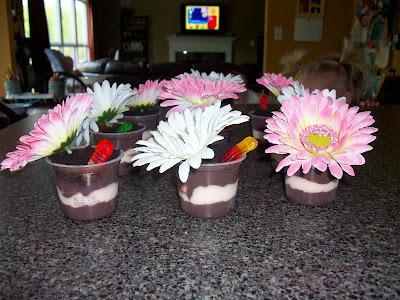 We brought some mini dirt cake treats for everyone! 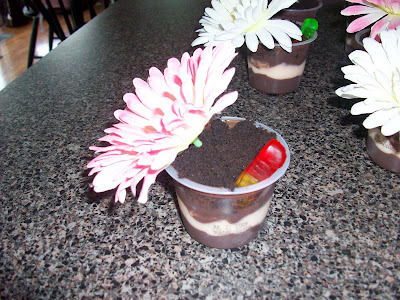 A flower, a worm, some dirt and pudding. 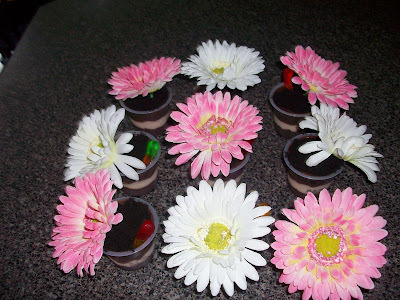 Mia LOVED helping me make these and felt so special to have her own fun day at school to celebrate her birthday. and starting KINDERGARTEN in the fall. How can time go by so fast? 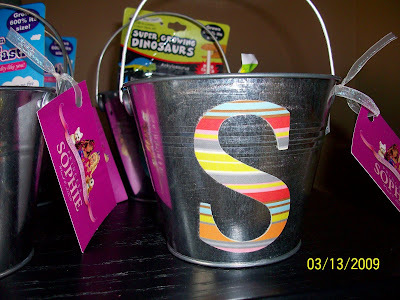 If anyone is in need of a cute party favor idea for your child's next birthday celebration feel free to hop on over to my etsy shop to get your own personalized buckets! They would be perfect to fill with candy or other goodies for your child to take in to school on their special birthday celebration day! I LOVE using one in the baby's room to keep all her pacifiers in one place! 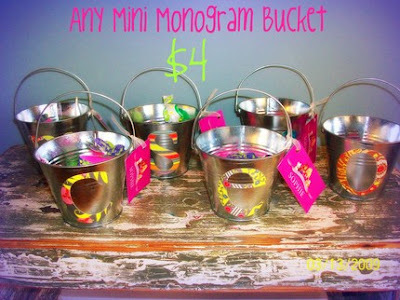 What would you use one of these monogrammed buckets for? Love your blog - it's very uplifting. I have an 18 year old son, a 6 year old daughter, 9 goats, 2 cats and 1 dog. Things are not really terribly girly here and that's okay, but your blog is like getting a bouquet of flowers:)My daughter and I would put fresh flowers, her hair-bobs and "make-up" and maybe some art stuff in those tins! Love'em! I'll enjoy following your blog! OMG! I mean, buckets - not tins!Ooops! I love the little dirt cakes! 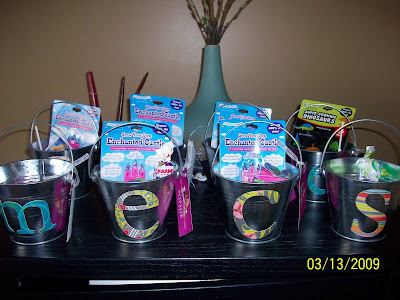 I would use one of the buckets to hold Sienna's hair bands or maybe all of her crayons! What a CUTE pic of Mia at the top! I wish Sienna would pose! Love your blog! LOVE THESE BUCKETS!!! Hello. For sure we would use these darling buckets for the new favorite toy in the house, puppy in my pocket, jungle in my pocket..etc. 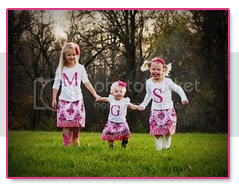 They are hard to keep track of, these would make it a lot easier to keep them all together. You have three girls and I have three boys (and a girl)...so you use them for Polly Pockets...we would use them for army men and little dinosaurs!!! Thanks for visiting http://ohmygluestick.blogspot.com where advertising is free! WOW! What cute buckets! I found your blog through a blog - lucky me! I would definitely use this for my daughter's hair bows/bands, or to hold a stash of tea light candles, or use as a flower pot, or...the list could go on...just love 'em... 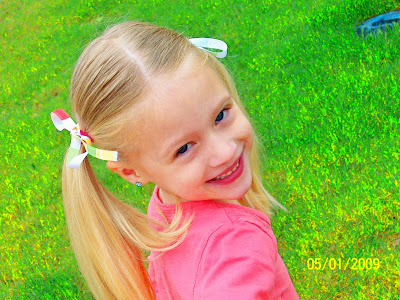 I will post this on my blog (http://theloftusfam.blogspot.com) and follow your cute blog. Sorry, I’m not a Twitter-er, hope I'm a winner!! WOW! What cute buckets! I found your blog through a blog - lucky me! I would definitely use this for my daughter's hair bows/bands, or to hold a stash of tea light candles, or use as a flower pot, or...the list could go on...just love 'em. I will post this on my blog and follow your cute blog. Sorry, I’m not a Twitter-er, hope I'm a winner!! Did I mention I will be moving into a new house this summer? 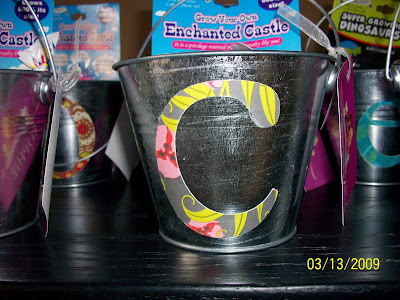 Well Lorelei said to tell you that her new room would look so much better with a monogrammed bucket! Hello, I came across your blog and saw that you are drawing for a winnerf or your buckets! Those are super cute and my daughter would love those. I hope Im a winner! Love your Blog Mart! I wish I was as creative as you!!!! If we had one of these we would probably also use them for the binky stash, someday for crayons and markers on a desk. Hmm, the possiblities are endless. Thanks for stopping by my blog, I am now following yours. i would use it for my daughters hair stuff, bows, and clips! i am going to follow your blog now! I love it! Hello! Thanks for coming to visit me! I am so excited that we found each other's blogs! I am now a loyal follower! P.S. I love the fun felt flower hair clips in your shop!!! So cute! I ♥ your blog! SO cute!